Hope everyone had a wonderful Easter Sunday and Happy First day of APRIL!! We had a great time with both sides of our family yesterday and it was absolutely gorgeous outside that I even got a bit of a tan! If you’re like me, you pigged out WAYY too much on Easter candy. I am definitely feeling the regret this morning but may I say that the treats we had were amazing!! 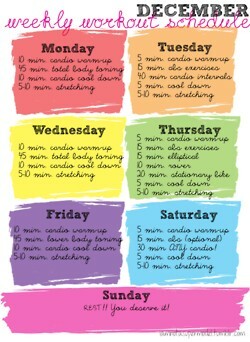 Today is the start of my workout plan; the countdown to the beach body season is officially in full swing! I’ve posted some of my favorite workout routines to share with all of you. Check back for some more posts on my workout goals and follow me along the way! Happy first day of April :) Great post!